Vung Tau with sea, mountain, and forest with man' s smart hands makes a natural and poetic landscapes bringing romantic moments for the best relaxation. By the sea, DIC STAR is located on Thuy Van Street. 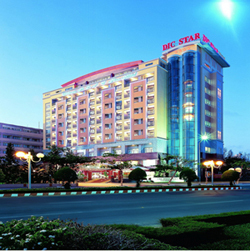 DIC STAR is first 4-star hotel in Vung Tau. With a large spacce (768 m²), a 400-seat-conference hall is located on the second floor. It is the most modern equipped in Vung Tau. - LCD Projector : USD 60.00/day, USD 30.00/half day. - Mineral water : USD 0.50/bottle. - Banner (High flex Design) : USD 06.00/m. - Back drop for meeting room (High flex Design) : USD 10.00/m2.